Once a year, volunteers in Mendham crank up the historic Ralston Cider Mill. The result: A sweet and tangy juice that’s worth the wait. 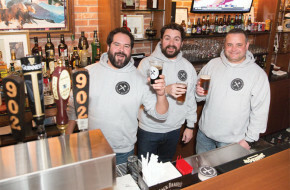 Three friends hope to help reconnect Mile Square City with its beer-brewing roots with 902 Brewing Co.
Jersey’s Palisades have a hike for every skill level—plus hawk watching, picnicking and more. From Bread to Brewery: East Coast Beer Co.
East Coast Beer Co. finally finds a home in Belmar. This "little lake that could" is a hidden gem in the heart of Cheesequake State Park. Indoor go-kart racing (safely) unleashes your inner speed demon. In the past six years, Michael Augustowicz has given more than 5,670 hours of his time to the Bergen Regional Medical Center, working closely with the recreational department to create therapeutic and engaging activities for residents. The Starland Ballroom has been shuttered for 10 months to repair damages from Hurricane Sandy. This month, the renovated venue finally reopens.